The File Security command displays the Security dialog, allowing the Administrator to individually set security levels for each variable in the file. One option for the security setting may be chosen from the four available security options. Security for a multi-level variables may be set only once, even though it appears in more than one column in the spreadsheet. The Hide Name option is the highest level of security. Hide Name will display no column for a variable with the Hide Name setting in the spreadsheet. When a file containing a variable with the Hide Name restriction is opened by a User (i.e, using the Open command), there will be no indication of that variable in the spreadsheet, and the User will not be able to unhide the column. The Hide Data option will display a column for the variable in the spreadsheet, but will not display any data for the variable. When a file containing a variable with the Hide Data restriction is opened by a User (i.e., using the Open command), the variable name will be displayed in the column header, but the column will be grayed, and no data will be displayed in the cells in the column (i.e., they will remain blank). The Disallow Edits option will display a column for the variable in the spreadsheet and the data for the variable will be displayed, but the data will be read-only. When a file containing a variable with the Disallow Edits option is opened by a User (i.e., using the Open command), the variable name and data for that variable will be displayed, but the User will be unable to edit the name of the variable, or any of the data cells for that variable. 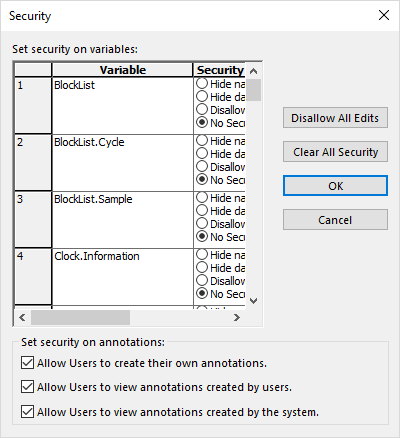 If all edits are disallowed, E-DataAid will also not allow the creation of new variables, or the editing of log-level names (see E-DATAAID: General Settings ). The No Security option will display a column for all variables in the spreadsheet, the data for all variables is displayed, and all data may be edited. By default, all of the variables within a data file are set to the No Security option, which is the lowest level of security.